(Nanowerk News) A new $AUD30 million research facility at RMIT University in Melbourne, Australia, will drive cutting-edge advances in micro- and nanotechnologies. The MicroNano Research Facility (MNRF) will bring to Australia the world’s first rapid 3D nanoscale printer and will support projects that span across the traditional disciplines of physics, chemistry, engineering, biology and medicine. MIT University's $AUD30 million MicroNano Research Facility. The City campus facility will be launched by Vice-Chancellor and President, Professor Margaret Gardner AO, on Wednesday, 27 August. Professor Gardner said the opening of the state-of-the-art laboratories and clean rooms was the start of an exciting new chapter in cross-disciplinary nano research. “At the heart of the MicroNano Research Facility’s mission is bringing together disparate disciplines to enable internationally-leading research activity,” she said. “RMIT has long been a pioneer in this field, opening Australia’s first academic clean rooms at the Microelectronics and Materials Technology Centre in 1983. Among the equipment available to researchers in the 1200 square metre facility will be the world’s first rapid 3D nanoscale printer, capable of producing thousands of structures – each a fraction of the width of a human hair – in seconds. Designed by architects SKM Jacobs, the MNRF also offers researchers access to more than 50 cutting-edge tools, including focused ion beam lithography with helium, neon, and gallium ion beams to enable imaging and machining objects to 0.5 nm resolution – about 5 to 10 atoms. inventing ways to use water to remove toxins from fabric dyes, with new nanotechnologies that can facilitate the breaking down of those dyes with nanostructured catalysts. “This facility is all about ensuring researchers have the freedom to imagine and safely realise the impossible at tiny scales and beyond,” Professor Friend said. The MNRF will be a key enabler of RMIT’s flagship Health Innovations Research Institute and Platform Technologies Research Institute. A unique teaching facility will also be affiliated with the MNRF. 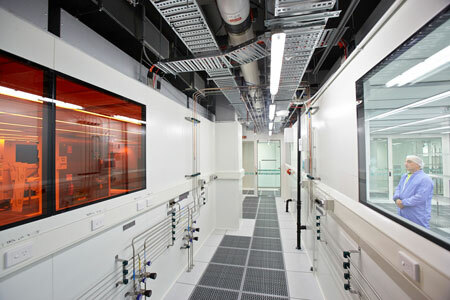 The Micro Nano Teaching Facility (MNTF) is the first of its kind in Australia, enabling undergraduate and postgraduate engineering student trainees to study clean room operations and micro-fabrication.